My heart speaks enough, though my tongue is silent. One of those Ronsardian ‘madrigals’, a sonnet with extra lines – here an extra couple of lines in the penultimate tercet. And what a lovely poem it is. Blanchemain has only one minor difference, in line 14 where he has “si cela est aimer” instead of “si cela c’est aimer”. The change is purely to the sound of the line (and this time the smoother effect of avoiding hiatus between the vowels “cela_est” is the improvement Ronsard sought. Qui me trouble le sang et m’augmente le soing. Ce mois qui du beau nom d’Aphrodite s’appelle. Tousjours à mon secours en vain je vous appelle. C’est qu’un cœur amoureux ne veut de compagnon. L’amant non plus qu’un Roy de rival ne demande. Pour n’avoir rien de vous la recompense est grande. Which troubles my blood and increases my cares. This month which is called by the fair name of Aphrodite. I am always calling you to my aid – in vain. Is that a lover’s heart wants no companion. The lover, like a King, demands no rival. A great repayment for having nothing from you! The reference to Aphrodite is, however, a little unusual: Ronsard usually names his gods after the Roman (Latin) version not the Greek. Qui ne veut endurer qu’un autre luy en jette. Trahit ma liberté, tant elle est indiscrette. Vendant de nuict mon camp aux soudars des Amours. Mes pensers et mon cœur me trahissent tousjours. Which cannot endure another glance at it. She betrayed my freedom, so indiscreet is she. Selling my camp at night to the troops of Love. My thoughts and my heart are always betraying me. Richelet explains line 5: ‘he follows the opinion of several including Aristotle who place the seat of reason in the heart, which – attacked by the eyes of Helen – forced and required reason to fall back and retreat to the head; from this cause lovers are considered without reason because Love chases reason from the heart when he wounds it’. Rendit ma liberté, qu’en vain je re-souhaite. Ouvrant l’huis du rempart aux soudars des Amours. She gave up my freedom, whichc I vainly demand back. Opening the gates of the fort to the troops of Love. Selling my camp and heart at night to Love. Nostre amitié promise iroit inviolable. Ce-pendant vostre esprit demeuroit immuable. O jurement fardé sous l’espece d’un Bien ! O perjurable autel ! ta Deité n’est rien. O parole d’amour non jamais asseuree ! N’entra (pour les punir) aux oreilles des Dieux. Our promised love would be inviolable. Your spirit yet remains unchangeable. O prison-sentence disguised beneath the appearance of Good! O betraying altar! your divinity is nothing. O word of love, never certain! Reach (as their punishment) the ears of the gods. The earlier Blanchemain version has a minor variant of line 2: “Vous me fistes serment, et je le fis aussi” (‘You made me a vow, and I made it too’). Tant j’ay dedans l’esprit ses beautés imprimees. Ny Dreux ny Jazeneuf n’eussent veu nos armees. Qu’il nous donne la paix, et de tes bras l’enserre. Qu’Anchise te faisoit sur les monts Ideens. So much are her beauties imprinted in my spirit. Nor would Dreux and Jazeneuf have seen our armies. That he might give us peace; hold him tightly in your arms. Which Anchises made on you, on the Idaean mountains. Richelet helpfully adds a footnote that lines 7-8 refer to ‘places in France marked by the misery of our civil wars‘. There were only 7 major battles in the Wars of Religion. The Battle of Moncontour (in Poitou) was the penultimate and took place on 3 October 1569 – largely between foreign merecenary forces! – with the surrender of 8000 Huguenots; Dreux (near Ronsard’s beloved Loir) was the site of the first major battle of the Wars of Religion on 19 December 1562, which brought the Catholics another hard-won victory; and Jazeneuf (or Jazeneuil) was the third, in late 1568, a relatively minor and even skirmish though it was followed by heavy casualties as the armies over-wintered close to each other. Venus is called on, as Mars’s wife, to calm his desire for war. Venus favoured the Trojans in the Trojan War, and was particularly associated (for instance in Virgil’s Aeneid) with the family of Aeneas, her half-divine son by Anchises. Blanchemain has only one minor variant: “à repos” for “en repos” in line 6, which has only a slight inflexional difference in meaning. Et auroit beau louer sa celeste origine. La matiere le rend plus parfait et plus digne. Vous dites que des corps les amours sont pollues. Qui se paissoit de vent et n’aimoit que de nues. And would congratulate itself on its celestial origin in vain. Substance makes it more perfect and more worthy. You say that love is polluted by bodies. Who satisfied himself with the wind and loved nothing but clouds. Ronsard the philosopher today! There’s a lot of what from context is ‘specialised’ philosophical vocabulary in here; I have paraphrased (or guessed at!) 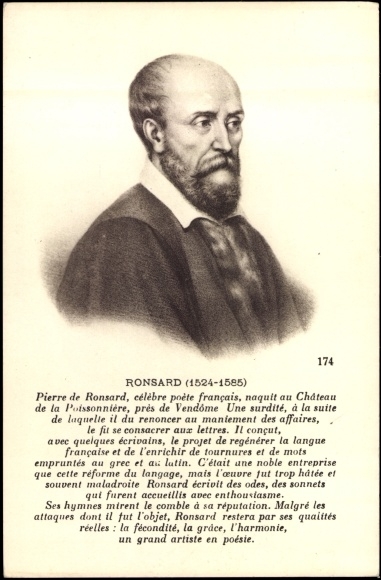 how Ronsard is using it to try to pull out the meanings. But “ingenieux” in line 7 defeats me: I am pretty sure Ronsard is borrowing the Latin sense (‘genius’=spirit) and it means something like in-spirited, within-the-body and therefore is a pun almost on the first half of the line, but I’ve left it as ‘ingenious’ since I can’t think of a way of catching that pun in modern English usage! The reference to Ixion is explained in a footnote printed by Blanchemain: ‘Ixion, Juno’s lover, embraced a cloud which Jupiter had made in the image of that goddess’. Et auroit beau vanter sa celeste origine. And would vaunt its celestial origin in vain.